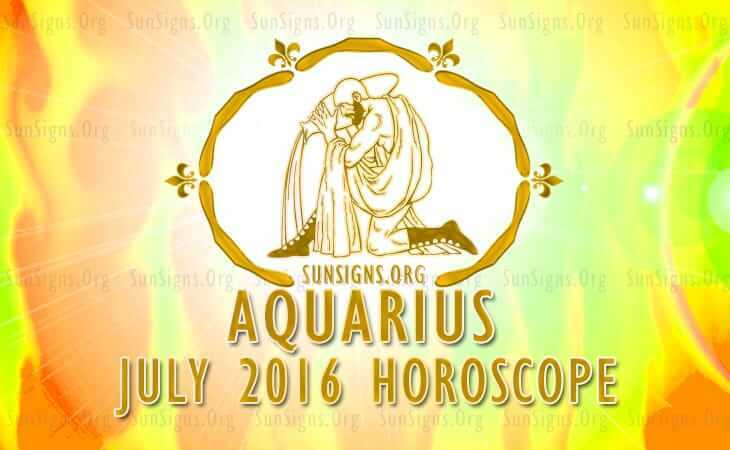 Aquarius July 2016 Horoscope predicts that profession and personal accomplishments will be in focus this month. With the forward movement of planet Jupiter, career and business growth will resume. Still family and emotional aspects are important along with career issues. For Aquarius zodiac sign individuals, the focus should be on the interest of others and not on personal enterprise and independence. Social charm and social grace will be necessary to achieve your targets in life. It depends on how well you can adjust to the environment and people. July 2016 is a good time for new jobs and business for the Aquarius personality. But be realistic in your expectations and do not go overboard with your dreams. This is not the right time for the Aquarians to gamble or speculate in the stock market. Plan wisely if you wish your career to progress. The July 2016 monthly predictions for Aquarius foretell that financial situation is a bit messy this month. Delays in earnings are to be expected and you should plan your finances to take care of these delays. Before making large investments, put your mind to the details. Expenses have to be controlled. After July 25th, you will get many opportunities to make money. As the financial planets are retrograde, use this period to make an assessment of your financial strategies and make a course correction. Aquarius, social activities will be a hindrance to your fiscal progress July 2016. There may be conflict with your spouse on financial matters and you may not have the same degree of support. You will have to put in more effort to get your desired earnings. July 2016 is socially very significant month for Aquarians in matters of the heart. You will be busy attending plenty of social functions and parties. Singles will have many opportunities to form romantic partnerships or you might even fall in love with your ex again. Influence of Mars will force them to be more sexually passionate in matters of love. Existing relationships may be under the weather and harmony can be achieved by compromise. Your spouse and family members will behave unpredictably during the first and last weeks of the month due to the influence of the eclipses. But this is a month when pregnancy will be discussed. The July 2016 Aquarius forecasts suggest that health of the water bearers will be wonderful during the month. After the 22nd, relax sufficiently. Your attention on diet and fitness routines will help you to maintain your health. Knowing your body dosha will help you choose the right foods. Relationships can be improved by maintaining pleasant friendship with your spouse or partner. Overall, the Aquarius horoscope for July 2016 foretell of a great month that is positive on both the personal and professional front.